Definition: Core Competence implies a pool of exceptional skills, strategies, moves or technology, that demarcates between a leader and an average player, in the industry. 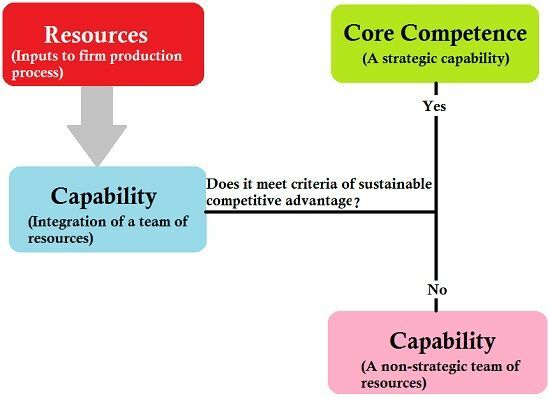 It is the vital source of competitive advantage, for a firm over its competitors, which leads to distinctive capabilities or excellence. It creates perceived value for customers. It has a wider market applicability. It makes difficult for the rival firms to imitate. The distinctive features of the firm are embodied in the collective knowledge of the people, along with the system of the organization, which controls the way in which employees communicate with one another. In other words, core competence is the technical and managerial know-how, experience and expertise, that makes a deadly combination of capabilities and resources for the organization, which helps the organization to get an edge over its rivals. Competitor Differentiation: If the products or services offered by the company can easily be copied, then the customers also switch to other products, if they are priced less, or have extra features. So uniqueness is the basic aspect that the products or services offered by the company should possess which cannot easily be imitated. If such products are offered by the company, then the company can consider it as core competence. Customer Value: In the quest to acquire core competence, the company has to deliver such products and services to the customers that have some value to them. Application of Competencies: The application of core competence is to the whole organization, as it can be achieved with the help of collective effort of the entire organization, that uses the distinct set of skills and technology, that opens up tremendous opportunities for the organization. If these three conditions are satisfied by an organization, the company is said to have obtained core competence. Core competency indicates the key areas, in which the organization should focus its resources and efforts. On the other hand, non-core activities of the organization should be outsourced. Core competency attracts strategic competitiveness and also help the organization in earning returns which are above average. Moreover, these are flexible and changes according to the environment, which facilitates the firm to make effective utilization of the available resources.